Article marketing can do a lot for your business. You just have to know a few things and here are some tips to help you out. 1. First, you have to make sure that whatever you are writing about is relevant. If you know for a fact that your product could be very useful, then do some research about it and then end the article with a link to your website. Before you upload the article, check if the site you plan to put this has this as one of their topics. 2. Just like what you read in the newspaper or see on television, the article must be both timely and newsworthy. This will allow you stay in touch with what is happening in the world. One good way is signing up with a site that gives you alerts with regards to certain topics. 3. Some writers post one article and that’s it. Just like movie producers in Hollywood, you should post a sequel to this because there could already be new information available which you could share to the public. 4. You should also make your articles viral. What this simply means is allowing other people to publish your article just as long as nothing is changed and you are given credit for it. Another way of doing this is offering your writing services to others which will become added revenue for you. 5. Each article you write must be short and simple. It must be short so that it will not bore the reader. Simple so that they will be able to understand the message you are trying to convey. 6. Just how many articles must your write to increase traffic? The good news is that you only need 2 to get things started. A good title will be “ how to do something” and “ x number of tips for something.” If this catches their interest, that person will most likely click on the link to your site and then buy something. The bottom line is that it increases web traffic. 7. You can stop at just 2 articles to promote your site. If you have other products, you can write articles on it as well and then mention in the resource box. This is known as cross-referencing which a lot of webmasters allow their contributors to do. 8. Aside from posting your written work in other websites, don’t forget to also put these in your own. If you have written 10 or more about the same topic, put these together to what is known as an e-book and then pass this along for free. Again, if people like what is written there then people wouldn’t remind reading it several times. 9. Aside from posting in websites, make use of RSS feeds. There are plenty of them around so make use of it. There are two ways to get into article marketing. The first is to write it yourself and just hope that people will appreciate your writing style. The other is to hire someone to do it. Some charge by the hour while others charge per word. It may be worth it if this increases traffic to your site. By following these article marketing tips, it won’t be long before you get a lot of hits. 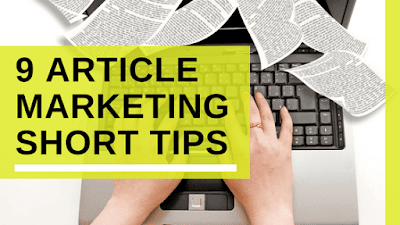 0 Response to "9 Article Marketing Writing Tips"